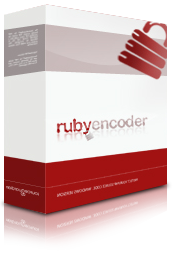 RubyEncoder is a product created by SourceGuardian Ltd, the same team who developed the SourceGuardian PHP Encoder and it is designed to quickly and securely encode, compile and encrypt your Ruby and Ruby on Rails files. This protects not only your intellectual property but also sensitive information contained within, such as database passwords. RubyEncoder also enables you to time limit files, plus you can lock files to a particular machine or IP address. 2. What are the benefits of encoding and compiling Ruby and RoR scripts? - Telework programmers who wish to ensure that they will be paid following completion of their work can use RubyEncoder to protect their work. Once they have been paid they can provide their clients with a fully-working and unlocked version. Ultimately if you have a commercial requirement for your Ruby or Ruby on Rails scripts then RubyEncoder can help. 3. How do my customers run RubyEncoder files? RubyEncoder provides, completely free, loaders that will run your encoded scripts on various platforms. Our standard loaders include Linux, FreeBSD, Mac OS X and Windows (MinGW Ruby from rubyinstaller.org and also native version of Ruby on Windows) but we can also create loaders on demand for nearly any platform. 4. Do I need to purchase a license to distribute encoded scripts? There is no need to purchase any additional licenses to distribute your encoded scripts. All your encoded files can be distributed for no additional cost. 5. What license do I receive for the encoder? You will receive a full unlimited license to use the RubyEncoder on one machine. If you need to move the license to another machine this is possible. Your code, once protected on this machine, can run on any machine that is covered by our loaders. There is no need to purchase any additional licenses to distribute your encoded scripts. 6. What platforms does RubyEncoder support? RubyEncoder is currently available for Mac OS X, Linux and Windows. Our loaders will run on Mac OS X, Linux, FreeBSD, Windows (RubyInstaller, MinGW) and Embedded Linux running on ARM. Also we have plans to support more operating systems for protected scripts execution. Our standard payment methods are credit/debit card or PayPal. We also accept direct bank transfers, but because of the costs associated we insist on the transfer charges being paid by the sender. Please contact us if you have any further questions. 8. Can I protect my Ruby on Rails application? Yes, with RubyEncoder you may encode and protect your Ruby on Rails application and particulary your application controllers, model and helper files as well as configuration files written in Ruby. Please download our User Manual and find further details in the 'Encoding Ruby on Rails' section.